KawaiiPunk - Kawaii Mascot Blog: Retro Heaven at Ridge Rooms! Retro Heaven at Ridge Rooms! Yes, even after half a century, the artworks of the 1950s continue to influence designers and illustrators to this day. And at the Ridge Rooms Zazzle shop you can pick yourselves up a retro packed slice of this 50s influence on a multitude of goodies! 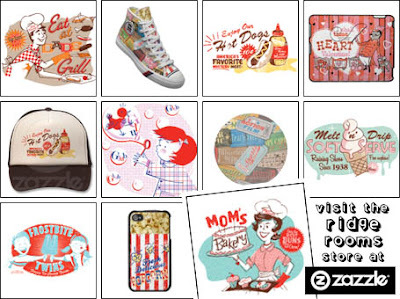 Ridge Rooms sells t-shirts, mugs, aprons, iPad cases, cards, and much, much more besides - many of which feature glorious illustrations inspired by my favourite decade! And, as if that wasn’t reason enough for you to pay them a visit, they’re also pretty darn cute too!